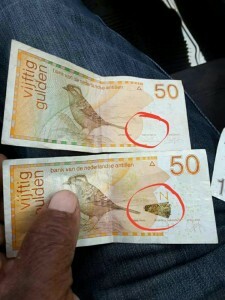 WILLEMSTAD - In a press release, the Central Bank of Curaçao and St. Maarten indicated that it has noted through the social media that there are counterfeit banknotes of 50 guilders circulating in Curaçao. The Central Bank wants to warn the public to pay close attention when accepting banknotes, especially the notes of 50 guilders. If anyone has doubts about a banknote, they are advised to refuse it. Perhaps unnecessarily but the Central Bank draws anyone’s attention to the fact that no person and/or institution is allowed to accept counterfeit money. They are advised to call the police as soon as possible when they think they are dealing with a counterfeit banknote. There is a prison sentence of maximum nine years for those who forge banknotes or deliberately pay with counterfeit money.